With the iPad Air now having launched in over 40 countries today, supplies of the device are starting to weaken in some of Apple's online and retail stores. The most significant signs of tightening supplies are appearing in higher-capacity models in some countries, specifically 128 GB and 64 GB cellular models and 128 Wi-Fi models. In a number of countries these models are now listed as shipping in 5-10 business days. 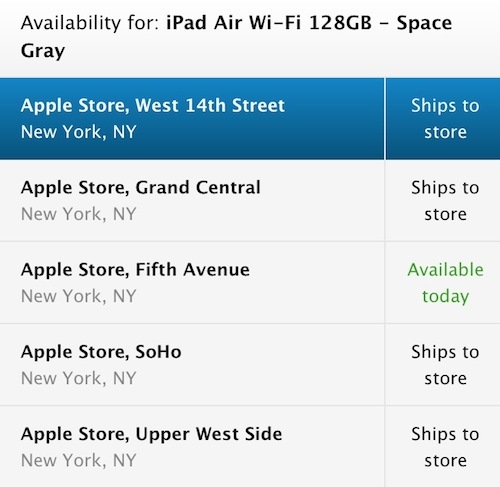 Apple's U.S. online store continues to list delivery dates of November 4 for new orders of all models, while those looking to use Personal Pickup to order their devices online and pick them up today at a nearby U.S. Apple retail store will find that supplies are beginning to dry up with increasing combinations of models and stores now listed as "Ships to store" rather than "Available today". Update: U.S. users interested in checking availability of Personal Pickup for various models may want to take advantage of Apple-Tracker.com for a much more efficient method than going through Apple's online store manually for each model. Update 2: The Space Gray 128GB iPad Air w/cellular on T-Mobile is the first model to see its shipping time slip on the U.S. store. It is now available to ship in 5-10 business days. Yeah... but I already have a MBA. I believe Microsoft are looking to experience 'weakened stock levels' with the Surface 2 but the only way to truly achieve that would be to only manufacture one. And then demo it. These new iPads truly are revolutionary. How can it be possible to pack so much cutting-edge technology into such a slim, light, gorgeous device? Only Apple can do this. And that's why iPad Air is already selling out around the world in just a few hours. Do you work for Apple? This sounds like a PR sound bite. i don't know why people buy high capacity ipads.... What do they fill it up with? And these things are meant to be upgraded every 2 years or so since apple gimp their old hardware every few os release. 1) People fill up their iPads with whatever they need to make it a useful & enjoyable device for them. Congrats, all you need is 16GB. Some people like to load up videos (esp for the kids), or keep photos on it as a digital photo book, music, magazines, books, apps (100-200mb apps are not uncommon these days). 2) What does the position that iPads are meant to be upgraded every 2 years have to do with what storage size one buys today? I don't see the connection there especially since Apple has kept the storage size and price points the same since the original iPad. 3) Your suggestion that Apple's gimps old hardware makes zero sense. The iPad 2 that you could buy today is the exact same one available two years ago. Apple didn't lessen RAM or change out the processor. Now, Apple does build new OSes to compliment the newest hardware, yes, but that is how you make technological progress rather than designing for the least common denominator. I think this is proof positive people are using iPads as laptop replacements on some level even if they dont realize it. Sadly, it tells them that they can continue to make 80+% margins on storage prices as long as they want. In some ways Apple has sort of hurt it's own "hype machine" by making so many available on launch day... hats off to them for getting stock up before launches, but the quick sell-off's of old really made people want them more... at least it seems that way. That said... looks like they are selling a ton today. It will be interesting to hear more on Monday if they release sales numbers. I wonder if all of the people that bashed Woz, because he said he wasn't going to buy one, because he was disappointed that they didn't come out with a 256GB model will now apologize? Or just maybe Apple only made a fraction of 128GB models in comparison to the 16/32's?